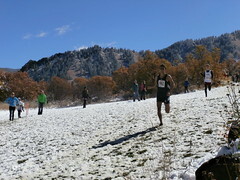 One doesn’t always have the opportunity to watch a cross-country running event in October in Aspen, Colorado. And, one especially doesn’t always get to see one run in the snow – but a couple of Saturdays ago, we did. This annual event is named and run in memory of local aspen cross-country phenom, Chris Severy, who sadly died at the young age of 22 in a bicycle accident on Boulder, Colorado’s Flagstaff Road in 1998. 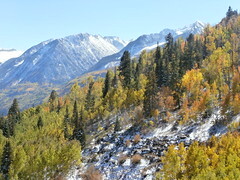 Some years it has taken place in the warm Aspen fall sunshine, sometimes there has been rain - but this year we got snow! 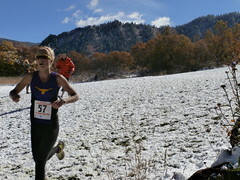 Many teams, some from such faraway places as Denver and Ouray, Colorado competed in what has become a much anticipated annual cross-country running event. 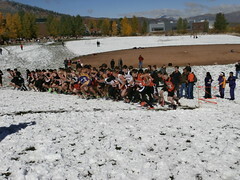 Undaunted by the elements, the boys and girls, ranging from middle school age to high school seniors, gallantly negotiated the slick, snowy course in the meadows and hills adjacent to the Aspen schools. Appropriately with the snow on the ground, skiing athletes from Basalt and Vail won the girls and boys varsity events respectively. All of the competitors seemed to give it their best effort as coaches, teammates and spectators cheered them on. Due to technical problems, we still don’t know who the team winners were. 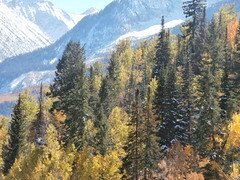 On a side note, later that weekend we also got to see the fall colors on McClure pass and from Aspen Mountain via the graciously-provided free gondola rides provided by the Aspen Skiing Company. 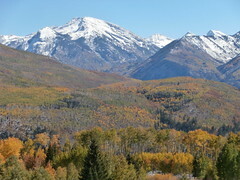 I have never viewed the fall color extravaganza from either McClure pass or on Aspen Mountain from up above on the gondola, so both were quite a treat. Now that the Colorado school cross-country running season in Aspen is over it’s time to look forward to the winter Colorado cross-country skiing season - and on the same course as the Chris Severy Invitational.